Hey guys! 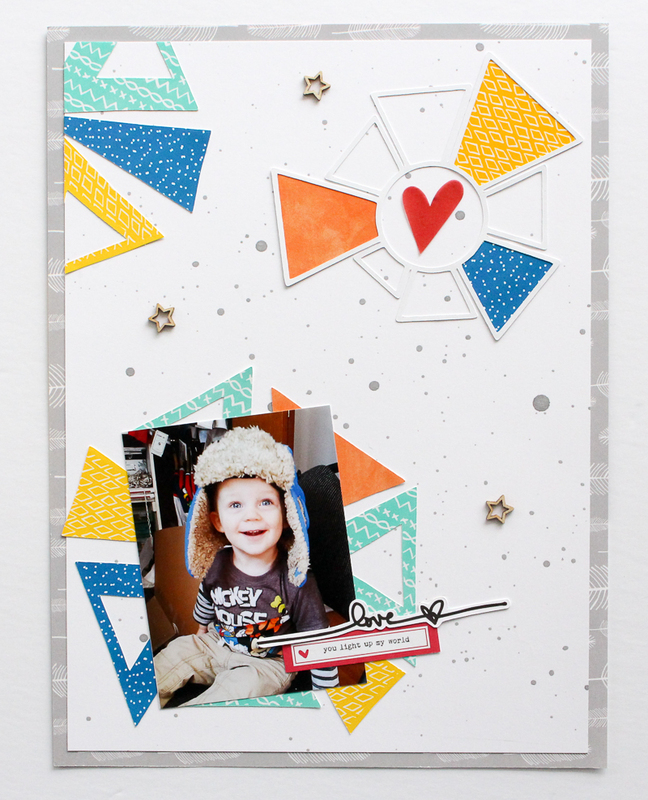 I'm back today to share a layout I made about my youngest son. Sorry for my unintended absence here. Things just got very busy at home, and blogging (and scrapbooking) have been low on my list of things to get done. Hopefully I can get back into some regular scrapping again. I have a bunch of pictures waiting to get into my Project Life album, and a few other page ideas brewing. But for now, onto my page. I have to say, I really love how this one turned out! I feel like it captures the very happy-go-lucky attitude of our Austen. 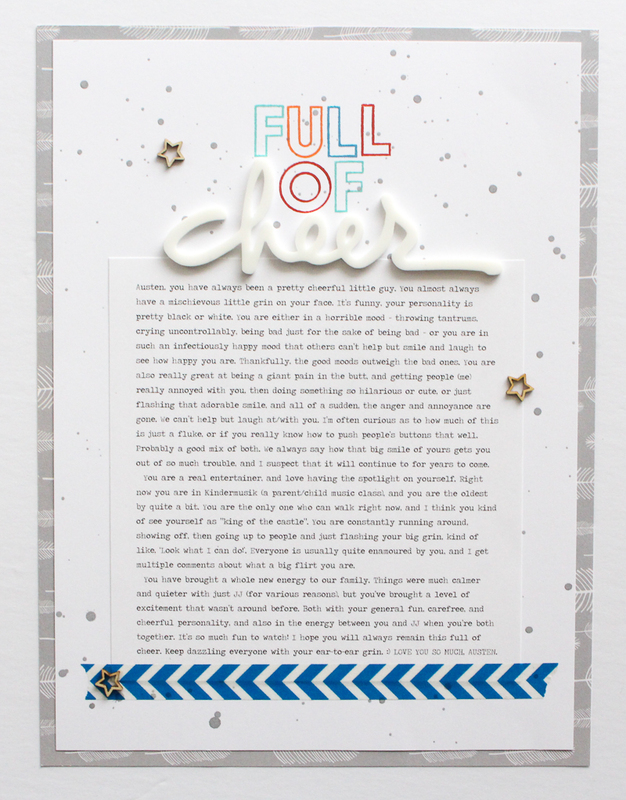 My starting point was the Cheer Story Kit from Ali Edwards. Even though I used very little actual product from the kit, the page idea itself originated there. 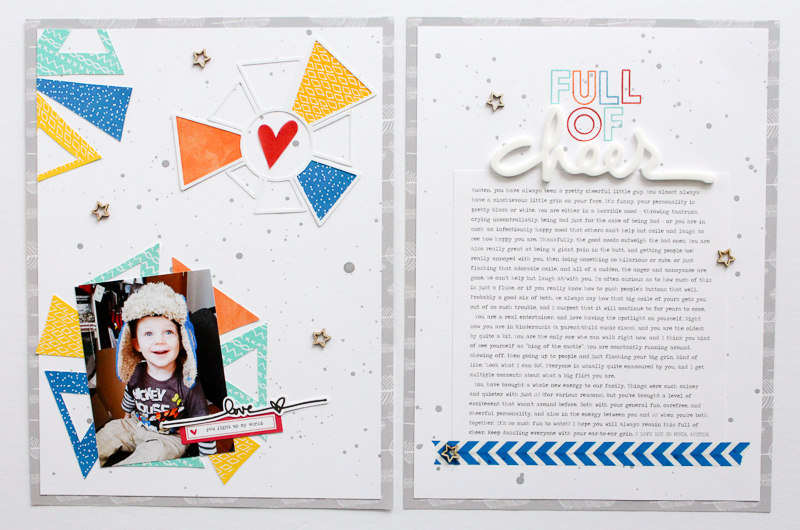 I wanted some bright and cheery paper to go with this layout, and ended up using papers from the Amy Tangerine Finders Keepers line. It's not always easy or convenient for me to get my hands on the paper lines I want, so I actually bought this in digital format, and printed some of the pattern paper out. I also had fun using the some cut files from the Let Them Eat Pie set by The Cut Shoppe. I wanted a clean white background so that the bright colours would really pop, but plain white just looked too unfinished, so I added some splatters from a spray mist I had on hand. Love how that turned out! Until next time, thanks for stopping by! Hi, I'm Nicole. I live in Winnipeg, Manitoba, Canada with my husband, our 2 young sons, and 3 crazy dogs. Here you'll find bits and pieces of our life, and how I document it. Thanks so much for stopping by!